Activated Covalent Bonding (ACB) technology, REO’s proprietary adhesive-free method of bonding optical components, can be used to produce a wide array of monolithic visible and IR optical assemblies, such as cube beamsplitters, x-cubes, and beam combiners and separators. ACB delivers bond strength matching that of the bulk material, but unlike traditional gluing, introduces essentially no wavefront distortion, minimizes scatter and absorption. Adhesive materials are also typically the weakest link in a beam delivery system in terms of laser damage, so the ACB approach substantially improves component laser damage resistance and operational lifetime. The REO covalent bond even stronger than optical contacting (molecular bonding). ACB bonds are also able to withstand long term exposure to elevated humidity conditions, and to temperatures exceeding 300°C. ACB is most effective when bonding materials that have similar coefficients of thermal expansion. While the process can be utilized for materials with mismatched CTE’s, the bond strength may be compromised and care must be taken to avoid large excursions in temperature which can create significant stress at the interface. An additional benefit of ACB is that it may be utilized for applications at wavelengths where adhesives are not transmissive. Most commonly used UV curing optical adhesives have excellent transmission throughout the visible and near-infrared spectral range, but show significant absorption in the UV (below 370 nm) and in the mid-infrared (above 2 µm). ACB is far superior because it doesn’t contribute additional absorption to the system, meaning it can essentially be employed from wavelengths from the deep UV through the far IR. 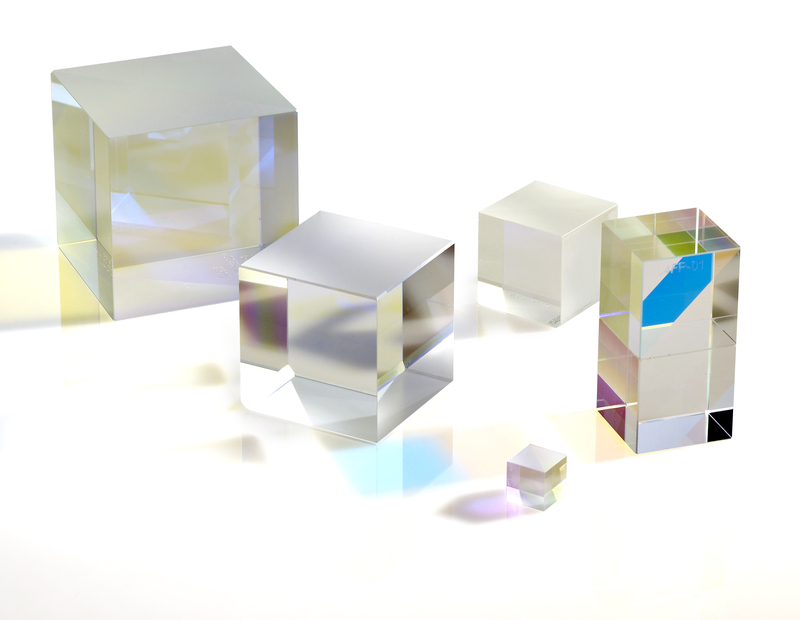 Applications of ACB: Beamsplitter cubes, prims assemblies, beam combining optics, etalons, laser rods Fused silica, silicon, sapphire, fused quartz, YAG, BK7, other CTE matched materials. REO utilizes state-of-the-art equipment and processes to produce multi-element lenses, prism assemblies, mounted beamsplitters, and a variety of other bonded optomechanics. Using both autocollimator and laser-based approaches to lens centration, REO can achieve better than 1um accuracy. When aligning elements with critical angle elements, REO has a selection of autocollimator, laser, and camera-based solutions which can provide accuracy to 1 arcsecond. REO uses multiple active alignment techniques depending upon the specifics of the components that need to be aligned. REO also utilizes automated dispensing of adhesives to ensure highly accurate and repeatable adhesive volumes. These systems can dispense a variety of adhesive types and can be configured to process high volumes of optomechanical assemblies in an extremely efficient and cost-effective manner. beamsplitters, and a variety of other bonded optomechanics. Using both autocollimator and laser-based approaches to lens centration, REO can achieve better than 1um accuracy. When aligning elements with critical angle elements, REO has a selection of autocollimator, laser, and camera-based solutions which can provide accuracy to 1 arcsecond.